Mill wound Coils measure (597 mm Max.). 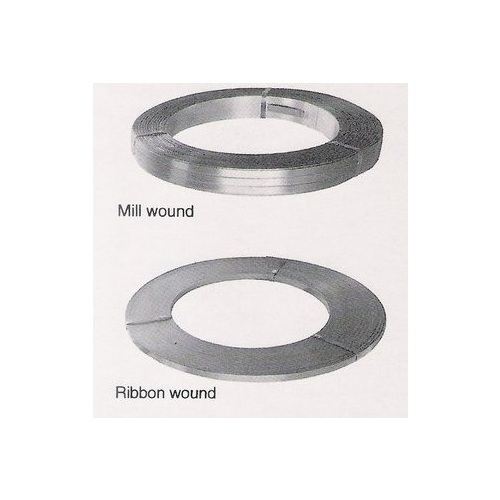 Those which are ribbon wound vary from (648 mm to 686 mm Max) depending on strap size. Weights listed below are for one coil of strapping. 1/2" - 3/4" (12.7-19.0 mm) Mill wound 41 Kg Min. Twelve mill wound coils make up a standard skid. The number of ribbon wound coils will vary with strapping width. painted and waxed Magnus is available in a coil. Other Apex or Magnus sizes can be produced in larger coils on a special manufacture basis. Contact your Signode sales representative for details. Uniformly high strength - ideal for demanding applications. High Elongation ensures better impact resistance. Uniform thickness and Width - Manufactured to very close tolerances for reliable use in hand tools and power strapping machines. Straightness - freedom from camber curt twist and concavity ensuring easy handling, reliable feeding and most effective use of each metre of strapping. Safe, smooth edges free of burr. Lubrication - special waxed coating provides for excellent transmission of tension around load corners for better reinforcement, and protection. Freedom from snaps. tangles and crossover. Freedom from edge crack and surface defects. Freedom from corrosion - 16 hours salt spray resistance as per ASTM B-117 standards. With extensive industry experience of 36 years, we are capable of supplying, trading and distributing of our clients a wide assortment of Welding Solutions, NDT/LPI-MPI Solutions, MRO Solutions, Rustlick & other Multi-Action Lubricants, Rust Preventive Chemicals, Metal Working Fluids, EZ Multi-Purpose High Performance Grease, Packaging Solutions and Industrial Belts/Hoses. Our entire assortment is formulated using superior quality raw material and is procured from the reliable vendors, such as ESAB India ltd., Magnaflux, ITW Chemin, ITW Signode, Nirlon and Fenner India Ltd. Widely appreciated for optimum viscosity, specific gravity and longevity, the range that we present finds application in pharmaceutical, chemical, petrochemical, cosmetic, transformer and textile industries. Our capacious warehousing & packaging unit helps us in successfully storing all sourced products in an organized manner. All these efforts have guided us in mustering a huge clientele across Indian Subcontinent.